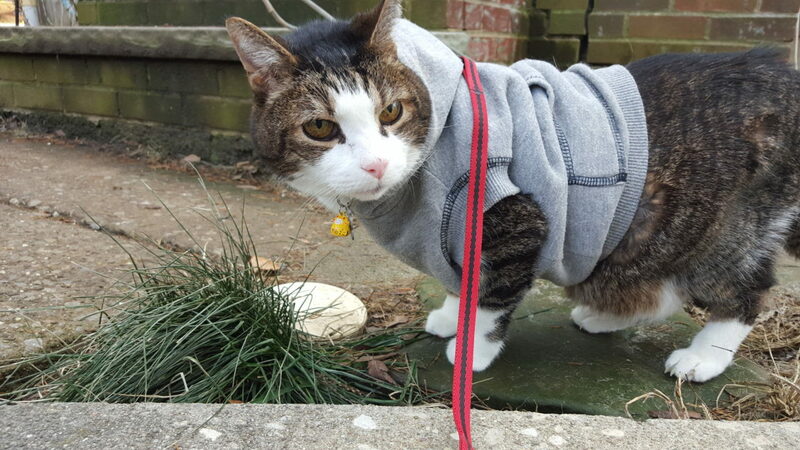 Most people are shocked to find out you can train a cat to walk on a leash. 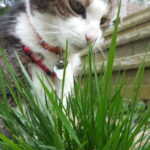 While the training process is quicker and easier with kittens, it is certainly not impossible to train older cats. 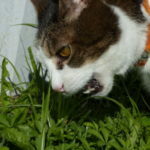 A basic understanding of your cat’s personality and health is all you need to begin. Well, that and a comfortable harness made especially for cats. It will also help to know your cat’s favorite treat or snack to encourage the process. 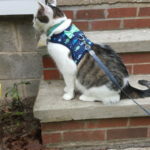 To begin, you will want to purchase a cat-safe harness. 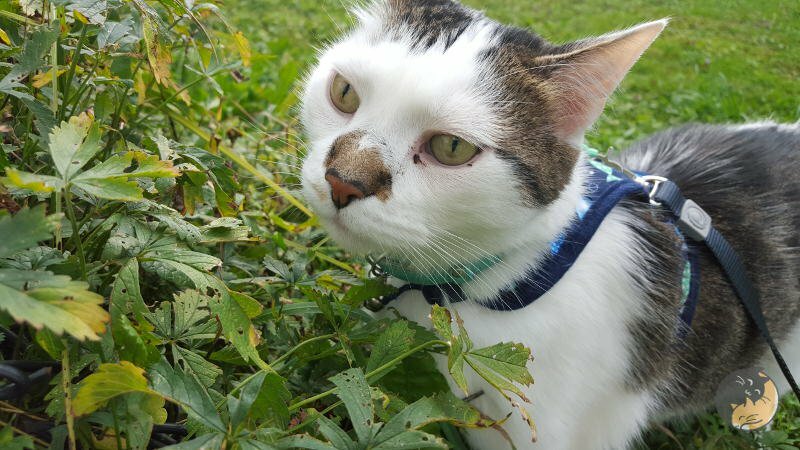 There are many brands and prices of cat harness out there. The two most important factors when buying one is the size and the security. There are a few different options when it comes to closing mechanism; the buckle, the snap-clips, and velcro. They also come in different thicknesses, patterns, and can be found at most pet stores for under $10. The standard figure 8 cat harness will do fine for starting out. You will also want to purchase a leash to go with the harness. Do not use anything heavy and nothing too cheap. Most cat leashes are around 4 feet long. 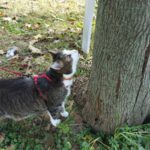 You can also purchase a retractable leash that has extended lengths of up to 30 feet but this is not a good idea if your cat is just learning how to walk on a leash. It is important that you make sure the size is correct when shopping for a harness. Some harnesses differ when it comes to what measurements they use. Watch the video to see and understand how to measure your cat for the perfect size harness. This is an important step as one that is too tight can injure your cat and one that is too loose will allow your cat to get out. 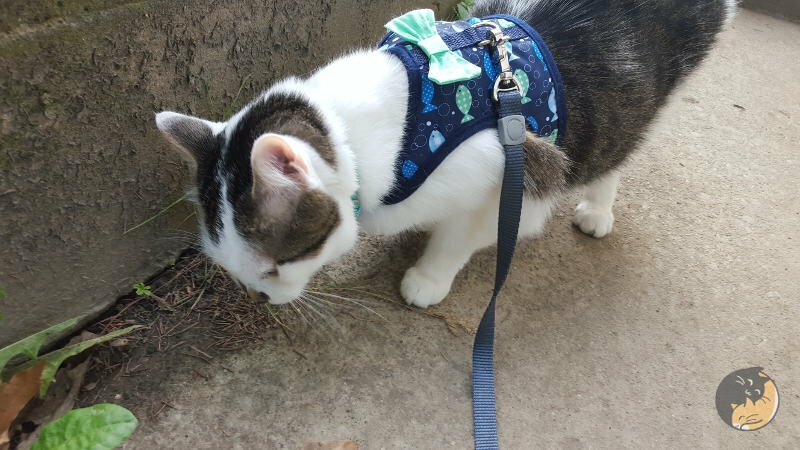 Once you have the harness and leash purchased and home with you, do not directly put it on your cat. You will want the cat to get used to it as an object first. To do this, simply place it where your cat eats or where he/she sleeps most often. 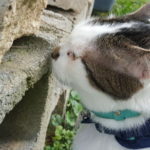 This will allow your cat to smell it, investigate it, and associate it with comfort. After doing this for a few days you can begin to allow your cat to wear it. When putting it on your cat, do it slowly, calmly, and with low-pitched talking. 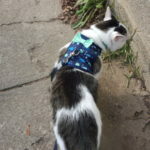 Reassure them they are not being punished because most adult/older cats will not like the idea of wearing one at first. 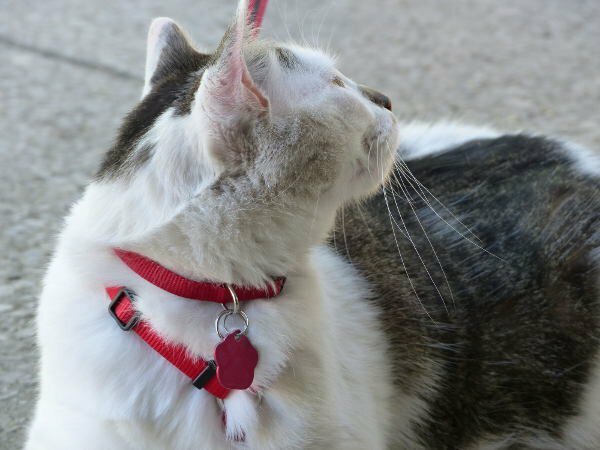 Once you have the harness on your cat, feed it some of its favorite treats. 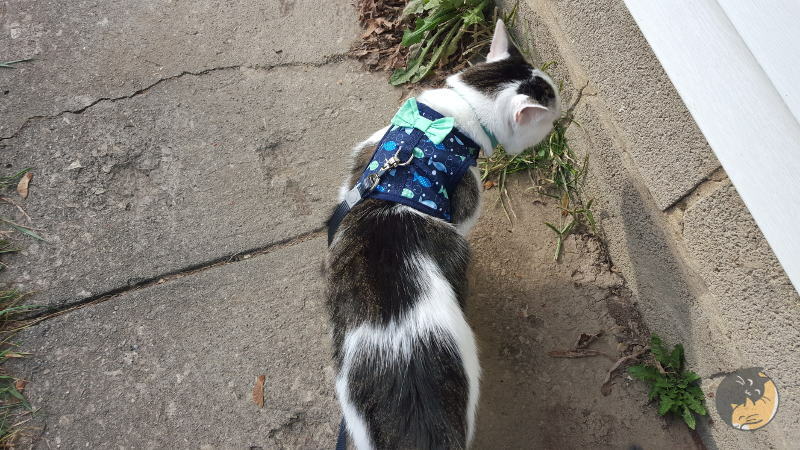 Allow your cat to walk around the house wearing the harness and adjust the tightness to fit them snugly but without putting too much pressure under the front legs. NOTE: You may notice your cat walking backward or throwing their body down, followed by an aggressive tail wag. This is normal and part of the process. Continue to allow your cat to freely roam the house while wearing it for up to one hour, then remove it. Once removed, again, feed them their favorite treats. Do this once a day for a week. Over time, your cat will accept it just like they accept a collar. You will NOT want to leave it on longer than an hour as it can be stressful and dangerous. After you have done this for a week, the next process is allowing them to get used to the leash. You will want to put the harness on followed by treats like you have been doing, but this time, attach the leash to the harness. Allow your cat to walk with the leash dragging on the floor. Let him/her play with it, chew on it, smell it, and so on. Leave the leash and harness on for up to 30 minutes, then remove the leash, remove the harness, and give him/her some treats. Do this for a minimum of 3 days. ALSO READ What Attracts Your Cat? 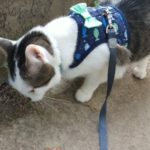 Once your cat is okay with the harness and the leash, you will want to begin training them to walk with you. Put the harness and leash on, follow with treats as normal. This time, you will want to hold the leash in your hand. As you do this, walk the distance of the leash away from your cat until you are slightly tugging on them. Your cat will likely resist. Take a treat and place it at your feet and allow your cat to walk to you. Continue doing this around the house, up and down stairs, and so on. Do this for 10 minutes, then remove the leash and harness, and again, follow this with treats. You can do this process with your cat 3 times a day. Continue to do this for a few days until your cat is comfortably walking with you on the leash. 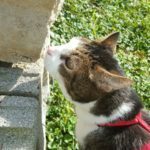 Now it is time for the fun part, taking your cat outside! 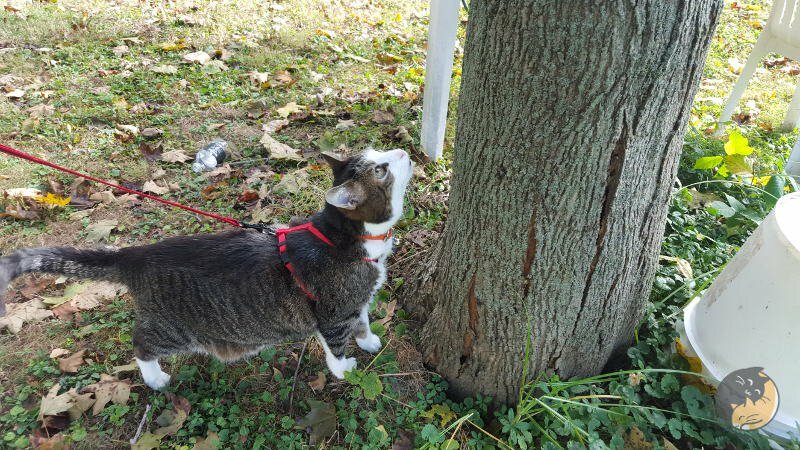 Put the harness on, attach the leash, and give your cat a treat. After they finish the treat, carry them to the door and walk outside holding them. Walk them to a safe, quiet area away from cars and other people, typically your backyard. Once you are sure it is safe, place your cat down and hold on to the leash. Allow your cat to walk about and follow behind. As you walk with your cat, lightly tug the leash to get your cat to stop, then allow it to continue walking. Do this for a good 20-30 minutes, then pick your cat up, and walk them back indoors. Once you are indoors and away from the door remove the leash and harness and reward them with a treat. You will want to do this every day around the same time for at least a week. The above video shows my cat (Joey) going for a casual walk. He is about 15 years old. 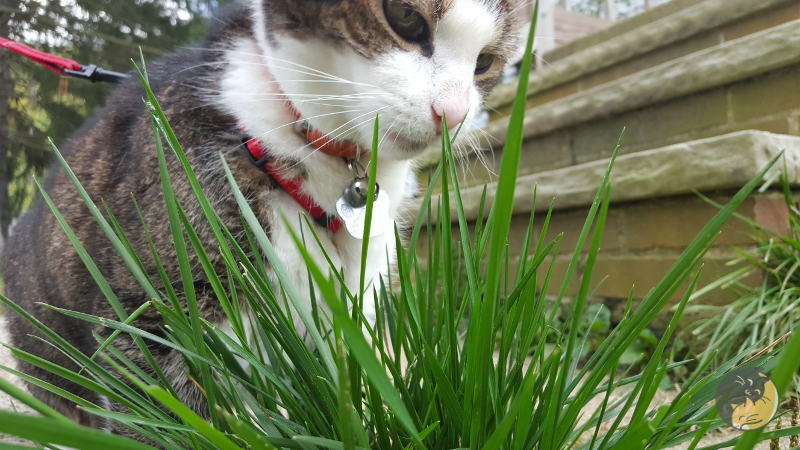 Once you feel your cat is comfortable to walk outside of your yard, begin to walk them about 100 feet away from your house and then back. Do this back and forth a handful of times, then return home. Each day, walk a little further away. 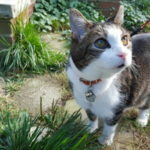 When you and your kitty feel comfortable enough you can begin walking them away from the house once and then back home. 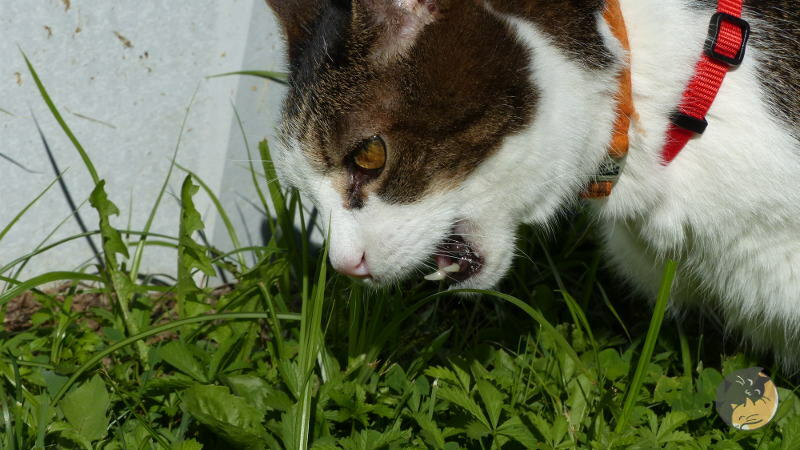 You may want to venture out to a quiet park to walk your cat to avoid cars. NEVER leave a harness on your cat for multiple hours. NEVER leave a harness on your cat while unsupervised. ALWAYS check to make sure the harness is properly secured. ALWAYS watch your cat’s reactions to certain objects outside. If they become nervous or tired while walking, carry them. 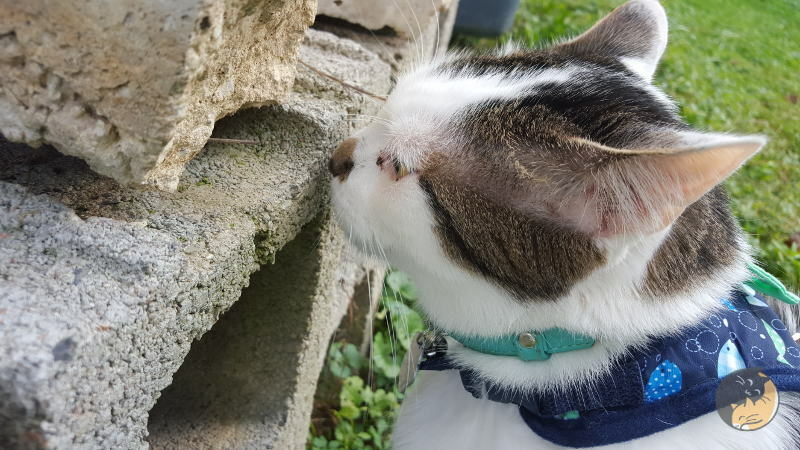 Always allow your cat to smell the surroundings and explore. 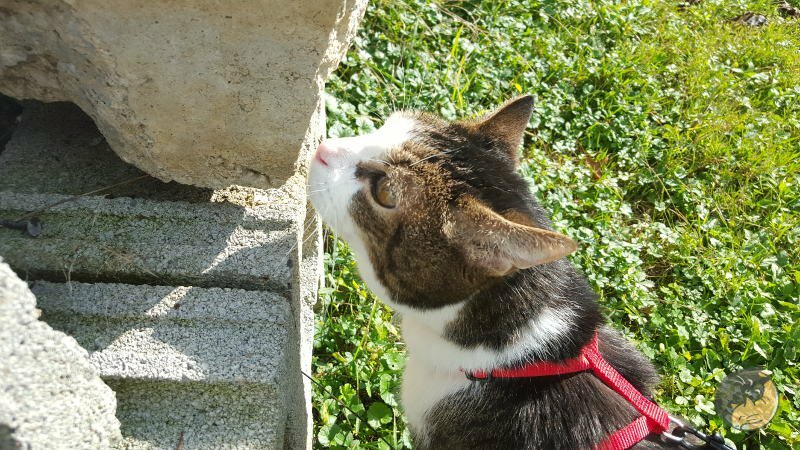 If your cat simply wants to sit for a few minutes while walking, let them. Never pull them where they don’t want to go. They are not like dogs who will be submissive to this kind of training. You have to encourage them to walk alongside you and this will take time and patience. Remember the process goes a lot quicker the younger you train a cat. I began training Twiggy at 5 months old. 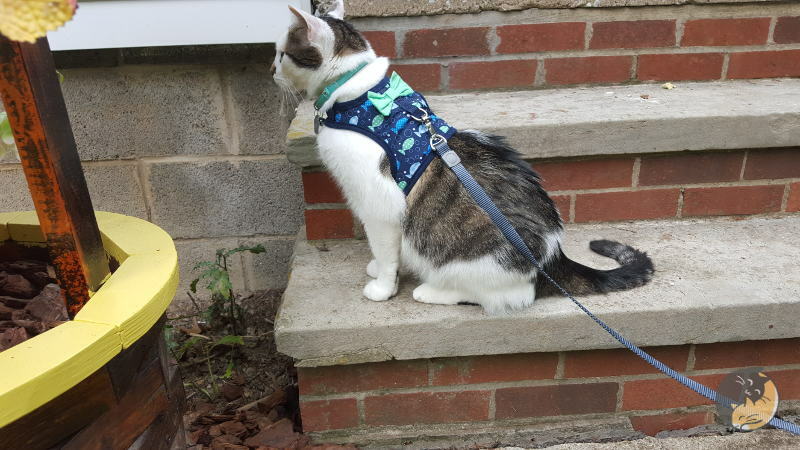 He still doesn’t like the harness, but once he is outside, he doesn’t even notice it is on. Joey was a stray I took in at an older age and he does great on a harness for not having training as a kitten. 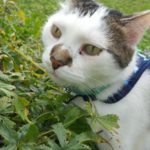 Do you take your cat out for walks? Where is their favorite spot? Share in the comments! Do Cats Go to Heaven? I have that same harness for my cat!